Thirty six hours is what stands between two worlds. These two worlds have their beauty and their misery, and their own struggles and triumphs. These two worlds are connected more than you would think thirty six hours would allow. 36 hours is what it took for me to travel to East Africa in January. 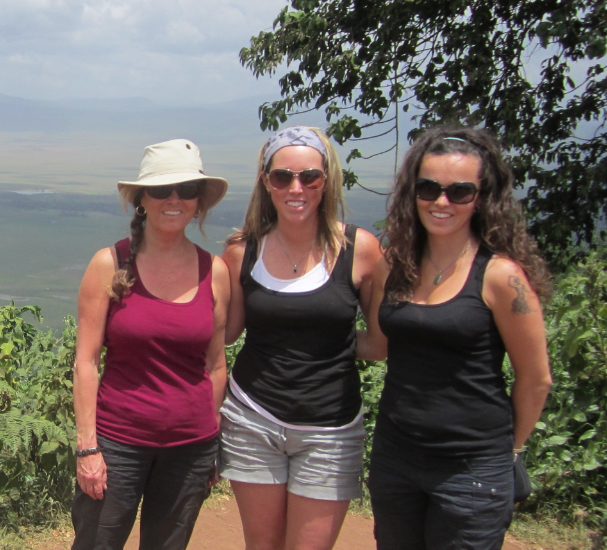 My mother, my sister, and I were fortunate enough to be able to participate in a safari that gave us a taste, perhaps a glimpse, into that area of the world to witness its hardships, as well as its resilience and beauty. some distance to be able to sift through my feelings and my thoughts in order to translate my experience into words. This was truly, as the cliché says, a trip of a lifetime. How can you ever recreate the dazzle of walking beside zebras, or the witnessing of a birth of a wildebeest and its first steps, or how we were held to our seats completely mesmerized by elephants grazing ten feet away from us? My mind often replays the snow cap of Mount Kilimanjaro as it peeked out of the clouds, and the cascading waters of Ndoro Falls. It gives me chills just remembering those moments. By far my favourite memory had to be falling asleep out in the open at the Ngorogoro Crater listening to a lion roaring in the distance. I struggled with a lot of guilt for taking such an extravagant winter holiday. Some of this guilt was eased by the idea of ethical travel. The company we booked with supports community projects through their tourism. All of the campgrounds we stayed at used the camping fees to fund their initiatives. For example, Snake Park operates a free health clinic, and the campground in Tango runs a Sea Turtle egg observation project. Travel really does widen our world. I am extremely thankful for the privileges I have had in my life to be able to see what I have seen, and I am fully aware that these are not experiences afforded to everyone. What traveling always brings home for me is that this world is extremely small, which is an important lesson in compassion and consumerism. The second campsite we stayed at houses a women’s weaving cooperative. They spin their own wool and dye it with vegetables. It employs 725 women. This initiative pays the women a fair price for their labour and it allows the women to work at home with their children. We tried to purchase our gifts for people back home at this place because we knew the money was going to the workers and not some foreign owned company. One of my most excited moments of the trip was when I learned that I have been buying from this co-op for two years at our local soap store in Port Dover. 36 hours away and here I was buying what I buy at home. There are so many stories I could share that happened 36 hours away from here. It is hard to know where to start and where to end. There are so many stories that need to be heard here in southern Ontario because of our thread in that story. I encourage you to find out about the slave market in Stonetown in Zanzibar and how that space has been reclaimed so that the merchants of the enslaved are not the only ones to own that history. Look up the Mnarani Sea Turtle conservation pond in Zanzibar that we visited on one of our last days, so you can be inspired by a small step that has made a big impact on local wildlife. The beauty, the resilience, the compassion and the strength of East Africa is overwhelming. As we are aware there are many struggles there, and many ways we can support them even though we are 36 hours away. You can buy fair trade tea and coffee, or purchase from 10,000 Villages who purchases from several collectives in Kenya. Fair Trade can be, but it is not always, more expensive, but it does make a life of difference. Even a simple act of listening or watching BBC World news or following global news on the internet sites, so that you are aware of the struggles and triumphs of that piece of the world, is an act of solidarity and understanding because it can create opportunities for you to give support by donation or letter writing through non-governmental organizations such as Doctors without Borders, Oxfam or conservation projects. 36 hours is a very short distance. It is four hours short of a pay cheque. It is driving to Ottawa and back three times. 36 hours is not enough hours for us to think we are in two different worlds and not connected. I would love for everyone to be able to travel 36 hours so they could feel their heart race watching lions basking in the sun or feeling the Indian Ocean rolling on the shore over their feet. Or to feel weak by acknowledging the timeless history of footsteps on the same piece of Earth you are walking on and to not even begin to comprehend the number of stories that have taken place. 36 hours is a privilege that I will forever been thankful for having had in my life.